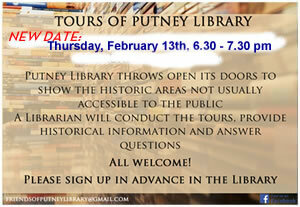 Last in the series of tours offering a chance to find out about all the hidden parts of Putney Library that are not usually open to the public. The tours will be led by a Librarian, who will provide historic background and will answer any questions. Please sign up on the lists in the Library, in advance.